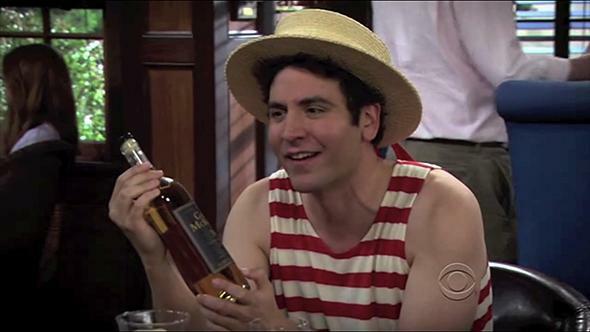 Glen McKenna: How I Met Your Mother’s scotch is totally made up, and it drives me crazy. I’ll miss How I Met Your Mother, but I won’t miss its stupid fake Scotch. Ted admiring some fake Scotch on How I Met Your Mother. As the series finale of How I Met Your Mother approaches, most viewers will say goodbye to Barney, Robin, and the rest of the MacLaren’s crew. But I’ll be saying good riddance to Glen McKenna, the Scotch whisky brand often ordered by the show’s characters. There’s Glenfiddich, Glenmorangie, Glenlivet, Glenrothes, Glenfarclas, Glen Garioch, Glen Grant—a whole liquor store shelf’s worth of Scottish whisky “Glens.” (The short explanation: A glen is a valley, usually associated with a river; many distilleries were originally built in glens to take advantage of the water supply.) But there’s no such thing as Glen McKenna. And as a Scotch-lover, this really, really bothers me every time the fictional brand is mentioned. Deep down, I know this is an unreasonable response. After all, Glen McKenna isn’t the first fictional tipple in TV history. From the “Screaming Viking” cocktail on Cheers to Duff Beer on The Simpsons to Klingon bloodwine on Star Trek, made-up libations have long been part of the story line. Yet somehow, this one got under my skin. Maybe it’s because I love whisky; maybe it’s because the Scotch is mentioned on the show repeatedly—particularly during this final season, in which it seems to be mentioned every few episodes. At least I’m not the only one with this unhealthy obsession—entire wiki entries and blog posts have been composed about Glen McKenna. I reached out to the show’s creators and executive producers, Carter Bays and Craig Thomas, to find out the story behind the elusive Glen McKenna. Turns out, it’s named after Chris McKenna, a writer and producer who had worked with the duo on American Dad!, and contributed an early story line for Barney. McKenna’s idea was a creative new scheme to (what else?) pick up girls. In this plotline, Barney dresses like an old man, walks up to a beautiful woman in a bar, and tells her he’s a time-traveler from the future who’s come back to tell her that if she doesn’t sleep with his younger self, it could threaten humanity’s very survival. Then Barney leaves and takes off his disguise. When he returns to the bar, the woman basically throws herself at him. In a post-DVR world where product placement has become almost expected (hello, Avion tequila in Entourage, and Budweiser, well, everywhere), it’s surprising to see a fictitious brand appear in prime time. But apparently, it has its benefits: “You can say whatever you want about it and not worry about getting the company to clear it,” Bays explained. “You can say it’s the most delicious and wonderful spirit on earth and nobody can argue with you. Or you can say it’s swill and not get sued. Although Thomas and Bays are asked about McKenna all the time (“People think it’s real, and want to know where you can get it,”—an impression surely perpetuated by the very real-looking prop bottles) they insist that they’ve never considered creating the brand, à la Ron Burgundy Scotch. But if Glen McKenna existed, what would it taste like? A throwaway line during the final season (“Highland clumps”) indicates that it’s a Highlands Scotch, a category that includes a fairly wide range of styles, from light and citrusy to dry and complex. In Season 4, Ted describes a sip of 50-year-old Glen McKenna as “smoky, with a hint of aged cedar,”—a deliberately vague and pretentious pronouncement in keeping with Ted’s character. Most likely, a 50-year-old Scotch would taste primarily oaky, dry, and austere after all that barrel time. No wonder the characters confess that they can’t distinguish the $2,500 bottling from a $10 Scotch. Thirty-year-old and 35-year-old bottlings, alluded to earlier this season, probably would be much more palatable. Based on the writers’ predilections and my totally subjective and unnecessary deconstruction thereof, I’m going to guess that a bottle of 30-year-old Glen McKenna would be honeyed and fruity, with a whisper of peat. That describes a fairly broad range of single malts—offerings from The Balvenie, Bunnahabhain, and Highland Park all come to mind. And I fully intend to have such a dram (though in protest, not a Glen Anything) to sip on as I toast the end to the series and mutter angrily into my glass, one last time.